Description: Provides the electrical elements library. The library is created to provide mnemonic elements of the user interface. The library is built on the basis primitives of widgets and JavaLikeCalc module, allowing to create calculations on the Java-like language. It is possible to connect the library of mnemonic elements of user interface to the project of the OpenSCADA station by downloading the attached file of the database, placing it in in the database directory of the station's project and creating the database object for the DB module "SQLite", indicating the database file in the configuration. The library contains about twenty widgets, often sought after in the mnemonic schemes' formation of the user interface of process control in the electricity sector. Names of elements are available in three languages: English, Russian and Ukrainian. By default, all widgets have the scale on both axes, equal to "1", and their rotation angle - "0" degrees. There is the ability to rotate, and scale of these widgets to specify the desired proportions. Below, in Fig. 1, the list of different types circuit breakers and switches is provided. Fig.1. 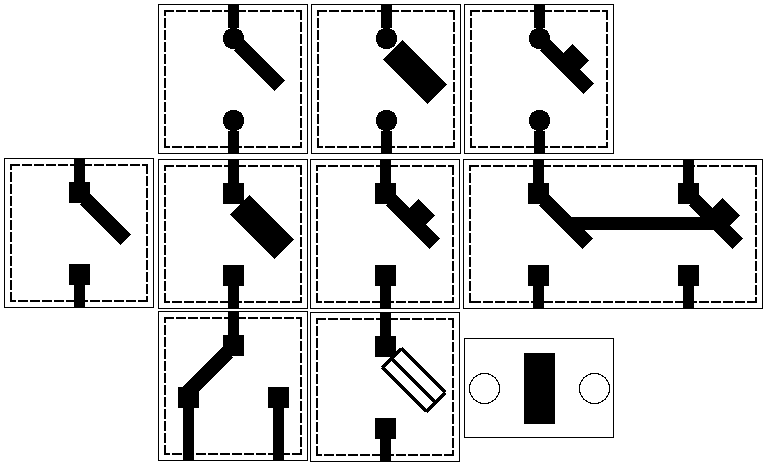 Elements from left to right from top to bottom: "Switch plank(circle)", "Fuse-switch(circle)", "Automatic switch plank(circle)", "Switch plank", "Fuse-switch", "Automatic switch plank", "Automatic dual band switch", "Switch with the neutral central position", "Fuse-switch 2", "Switch". Figure 2 shows examples of the same elements in the off position except the "Switch with the neutral central position" widget. Fig.2. 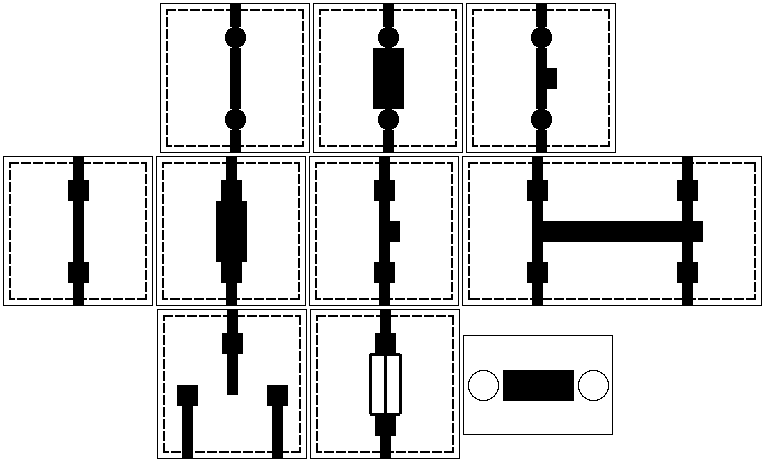 Elements from left to right from top to bottom: "Switch plank(circle)", "Fuse-switch(circle)", "Automatic switch plank(circle)", "Switch plank", "Fuse-switch", "Automatic switch plank", "Automatic dual band switch", "Switch with the neutral central position", "Fuse-switch 2", "Switch". Below, Fig. 3, Fig. 4 shows the static at the moment the elements of the library. Fig.3. Static elements from left to right: "Coil", "Reactor", "Transformer", "Transformer with two secondary windings", "Ground". Fig.4. Static elements from left to right: "Battery", "Rectifier", "Direct current converter".